Today we want to share a video that explains how a fire in an apartment and the smoke coming from it spreads throughout the building. They also explain what the firefighter’s reaction is to prevent a bigger damage. 1- The fire starts in one of the apartments on the first floor with all doors closed. The smoke is contained inside the burning room. The occupants must leave by the emergency exit leaving the door open. 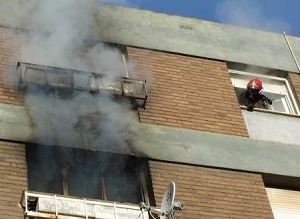 2- Smoke completely floods the hole in the ladder. If the top floor door is closed the smoke does not affect it. 3- We open the door on the upper floor and the smoke floods it instantly. If the door opens, smoke spreads throughout the building. We open the door of the terrace of the stairs to ventilate. We vent the hole of the staircase and the affected floors. 4- We have to close all the doors that we find to avoid spreading the smoke. We should never try to climb down a ladder full of smoke. If the ladder is full of smoke, it is better to lock yourself in the house, put rags or wet towels on the edges of the doors. Once the firefighters arrive, show yourself through the windows so firefighters will see you.